We’re certainly not the first bloggers to find ourselves stretched thin between the demands of our regular working lives and the rather strange, post-modern existence we eke out on the interwebs, and, as happens to us every now and then, we’re kind of in the middle of one of those periods right now. Combine that with the fact that it’s been crazy hot here lately — making the prospect of getting creative in the kitchen of our sweat-lodge-like four-story walk-up apartment distinctly unattractive — and our resulting culinary output has been truly meager. On the few occasions we have been behind the burners, it’s only been for short periods, and, in this case, just long enough to cook marinaded baby octopus a la plancha in a cast-iron skillet. This is the result. It was delicious, and, yes, our apartment was a few hundred degrees for the rest of the evening. Seeking to avoid these sauna conditions, we have recently resorted to the dangerously illegal practice of grilling things over a tiny fold-up barbecue on the roof of our apartment building. With a bit of luck, the steamy conditions will break before repeated exposure to grilling temperatures melts a sink-hole into the ceiling above us. 1lb baby octopus, cleaned and sliced down one side to open them up. In a non-reactive bowl, place octopus, salt, ground fennel seeds, black pepper, red pepper flakes, olive oil, orange juice and chopped up fennel tops. Stir well and leave covered for up to 1 hour. Slice fennel bulb into 1/4 inch slices, long-wise and arrange on a baking sheet. Anoint generously with salt, black pepper and olive oil. Put in oven for 15 minutes, turn slices over and repeat until they start to get crispy. Shake marinade off octopus, and place in hot pan. Cook each ‘pus for around 3-4 minutes per side, before turning over. After first side is done, you’ll notice a reddish brown gunk on your pan, before turning over, scrape as much of this off as possible, as it’ll start to burn and give your octopus a bitter flavor otherwise. 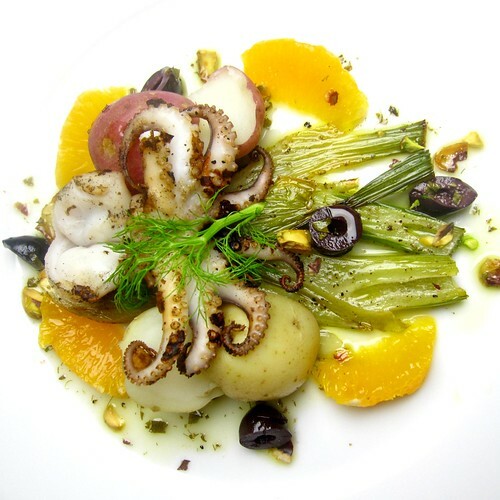 Remove cooked octopii to a plate until all are done and then serve with roasted fennel, supremes of orange, kalamata olives and pistachios. We added boiled potatoes to make it into a main course, but feel free not to if you’re making it as a first course. Serve with a chilled white wine, an albarino would be rather nice. This does look delicious! And refreshing. Though, would it be totally déclassé to use squid instead? It cooks more quickly and perhaps heat up the house less. 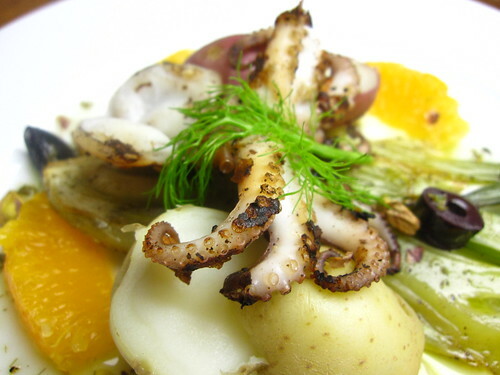 @Julia – squid would be perfectly delicious, I’m sure! Dusting off the grill, heading up to the rooftop and shelving any suicidal fears are well worth the trouble to grill some octopus. Love the beasties I do! Kudos to you two. Last summer, I think I ate cold cereal for dinner more than once, or I stood over the sink to eat an entire cantaloupe. And lots of take-out. Grilling always seems like too much trouble when it’s hot out, but if it save the temperature of your indoors, I guess it’s probably worth it. Ooh, what about the basement? Does your building have one of those? Ha ha! You sneak around well. I have always been tempted to find a tiny grill to use on my balcony, but my building has its busybodies. There is one woman who if she catches you putting your trash in the wrong place, she’ll carry it back to your apartment and put it in front of your door with a note. I can’t imagine what she would do if she caught me grilling. I hope she never walks by the apaartment of the guy who lives two doors down from me on a Saturday morning since every Saturday morning he makes the hallway reek of marijuana. Oh they look delicious! 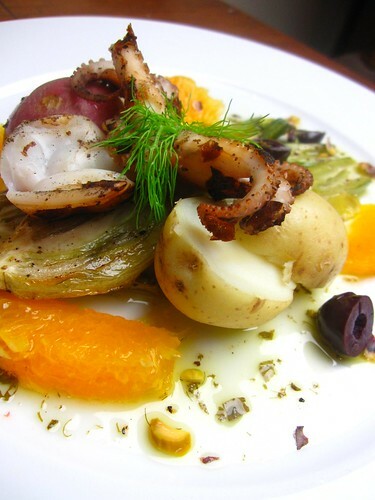 Given the heat we’ve been having, I’ll probably just grill the fennel right before the octupus (or squid! yum) or just leave ’em raw. Yum. Great combination of flavors – all my favorites + pistachios. This may sound like the kind of thing Mrs. Thistlebottom would say, but I hope this sounds less school and more cocktail party: “octopus” is Grecian, not Latinate, so the plural is “octopodes” or, more liberally, “octopods.” Take it or leave it, of course, but I think it’s much more fun to say octopods than octopi. 🙂 I read your blog religiously. Keep up the good work! @Chris – thanks for the correction and the props (as well as admitting to being a regular reader!) – and please, if you see something else that’s erroneous, feel free to call us out when we get it wrong. There really is nothing we like better (see here for an example: http://www.weareneverfull.com/arroz-con-gandules/) because (and not to sound too trite) but like food, knowledge is best when shared.